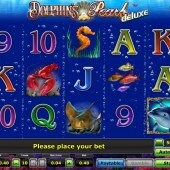 Dolphin's Pearl Deluxe is a 10-line video slot based on the popular 5-line version - Dolphin's Pearl. The deluxe version is essentially the same game but with a modern look and some extra bonus features. 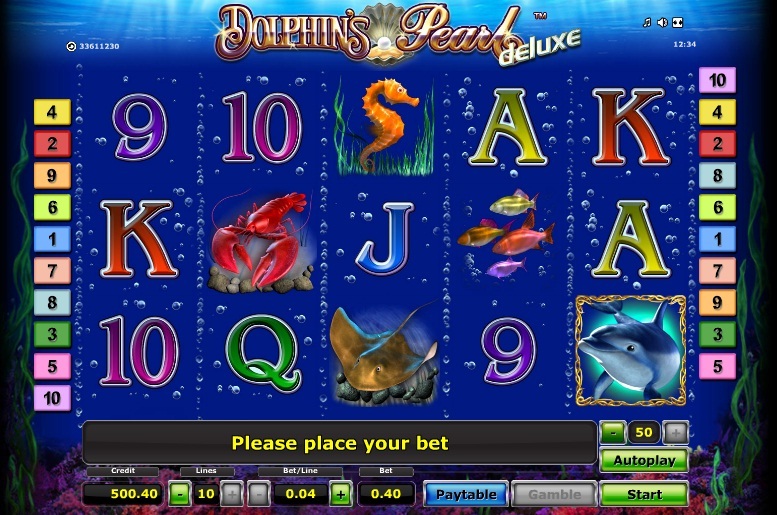 Dolphins Pearl Deluxe was released by Novomatic online at a number of online casinos and is still a popular choice for real-money players to this day. The main way to get a decent win on Dolphin's Pearl Deluxe is to trigger the bonus round and activate 15 free spins with a 3x multiplier. This can be done by getting three or more shell scatters on any of the 5 reels. The free spins can be retriggered, and does so regularly during the bonus round, as there are more shell scatters on each reel during the free spins game. If this happens then you can be in for some very nice wins. Like many other Novomatic slots, Dolphin's Pearl Deluxe is a volatile slot, which means that you can go for long periods without triggering the bonus of winning the main game. In this way it makes the game similar to other exciting, if unrewarding, Novomatic slots like Katana or the great Egypt-themed Book of Ra Deluxe. If you are new to slots this can be very frustrating, but for more seasoned slot players you will be aware that the wins do come and can potentially be a lot bigger.